Today I had to do my least favorite chore when it comes to Cocoa. Change the litter box. I especially don't like doing it since I got the corn cob litter. It does not absorb very well. That bag is almost empty though, and soon I'll be back to using Yesterday's News. If you haven't tried that litter for your bunny, I highly recommend it. Flushable and made from recycled paper! So once I empty out the litter box, I have to clean it with vinegar. I have never liked the smell of vinegar. It's just horrible. The one plus is that Cocoa has a small litter box. During the time I'm cleaning it out, I let Cocoa run around in my room. 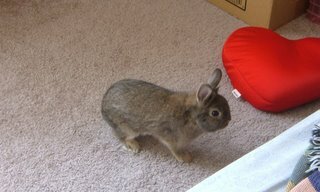 He enjoys the freedom to explore and hop and play. 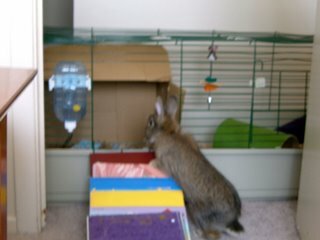 The problem is, it's really hard to catch Cocoa and get him back into the cage. He has too much fun being out. Finally I gave up on trying to catch him, and just brought his cage over to let him jump back in when he was ready. It worked...eventually. Yeah it's annoying to catch that bad boy. But those pics are always cute.